When a spiritual teaching is meant to increase ego, it is all about “becoming,” changing, transforming, conquering. When a teaching is meant to decrease ego, it is about peeling, unlearning, taking away. Both teachings are necessary according to the consciousness and level of awareness of an individual. That is why, there is no religion able to bring “enlightened” individuals in mass production. We ARE already complete, but we have acquired layers of “knowledge” to identify with, set of beliefs to follow, and gathered traumatic experiences in Life which are difficult to accept by an ego in pain. Things did not occur the way we desired, so we felt hurt… and to make it a deeper wound; we decided not to forget that incident. When the baggage is gone; thoughts will diminish in our minds as clouds dissipate in a sunny afternoon. We could look at things without emitting a thought. The sky could be glorious; immaculate bright and blue like a swimming pool. As long as there are no words in our minds, we could be lost in the experience of seeing. That experience is felt and thus, we will feel fulfilled. How do we kill that experience? Thinking, words, expressions will not allow us to be in communion with that which we experience. To say that the “sky is pretty” does not add or take away anything from the sky. It is just a judgment value, a way to fill the “boring” space of silence between people or even within ourselves. The type of silence that I am talking about is not something DONE artificially; it is something natural, which appears as our emptiness increases. Paradoxically, it is in that silence when there is greater communication between lovers, between friends, between creatures of Nature. Silence is the common ground. The sky is blue and bright. The sky will be gray and dark. It will happen. Matter of fact. It is a process. It is a matter of time. Why then use a word such as “beautiful” to describe the blue sky? Why create the dichotomy of “beautiful and ugly”? That is exactly what we have been trained to DO. We label and create a duality. Thus, we choose between A or B and create our own suffering. We judge and create our downfall at the same time. The blue and the gray sky… It is the same sky at different times. To enjoy both states is to go beyond qualifying words. Language needs contrasts, but we do not need to believe in language as “reality”… Then we are away from the duality, the dichotomy. Then communion happens between the observer and that which is observed. There is union without looking for it, thus… true union. Oneness becomes an experience and not just another “pretty” buzzword. When we learn to trust life, we could truly observe without coming from a particular point of view. If we just sit down to “meditate” or observe, we may need to be aware of the thoughts arising. Those thoughts have a story which are glued to our inner feelings, those thoughts will maintain the sense of self. We become self-absorbed. This enjoyment is not a “Look, how beautiful!” wordy remark; the little thoughtful voice speaking to us. There is no voice there, but the sense of appreciation and gratefulness arrives, as we are part of that scene in the “now.” It is a feeling. What Ananda is trying to transmit is this: There is absolutely nothing intellectual, no beliefs, no words or labeling in the moment of appreciation and gratefulness. To appreciate the “now “ for “what is” means to go away from every expectation. When we learn to connect to Life as an empty space, with the inner door wide open, then a smile comes out. There is nothing that “I” expect. Nothing to be afraid. What is happening is all right. This has been labeled as “contentment.” However, observe that this contentment is not born out of a method or a “realization” that “I need to be content.” This “contentment” is not faked. Observe that contentment is a feeling, just like happiness. Observe that contentment arises when the sense of “I” diminishes. Observe that to get to that “I” to open up by itself, to diminish that sensation, we may need to take away the layers of “stuff” that are bunching up and clogging up that natural state of openness. At that point the “job starts.” This is the point when a “seeker” is born. Before that moment, it is just playing about being “spiritual” and socializing. How does the job start? 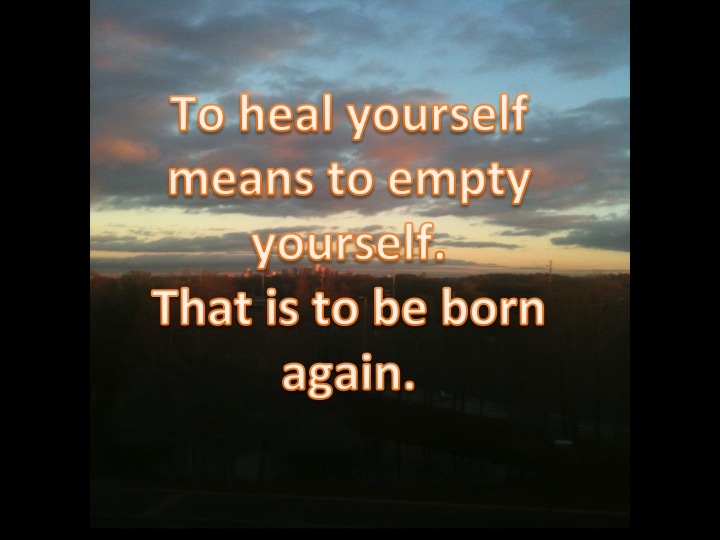 It is known as healing “yourself.” Catharsis. Contentment is appreciation and gratefulness. When you are that state of being, it does not matter what we “think” we are. It does not matter what belief system someone embraces. It does not matter if the world disappears the next day. It does not matter if we found God or not. It does not matter… we are OK with “what is,” we are one with everything. We are one with thoughts and beliefs, we are one with the world… we are one with God. Then consciousness will change without “effort”… by itself, for there is no one there (the “I”) trying to prevent that change. Since there is a recurrent issue with the quality of the audio in the “BlogTalk radio” website; there will be a change in the format of sharing. Avyakt7 (Ananda) will be recording for 5 to 10 minutes only. Short sharings in different topics via MP3 files. These sharings will be available through a link here. The purpose is to fully express what cannot be put into written words. This is the last one via BlogTalk radio. Below the latest talks (25 minutes) in English and Spanish.